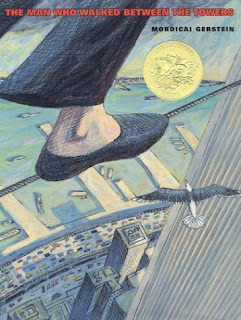 Gerstein's beautifully illustrated story about a daredevil tightrope walker shows us the power of art to transcend tragedy. In the wake of 9/11, Gerstein presents us with a light-hearted memory that pays fitting tribute to the memory of the towers. There is another man that the New York Times has dubbed "The Man Who Walked Between The Towers. ": presidential candidate Rudy Giuliani. Pundits wonder how much longer he can use the political capital of being America's Mayor during 9/11 without appearing to exploit an American tragedy. Talk about walking a political tightrope. At a recent campaign stop in South Carolina, Giuliani never actually uttered the words "nine-eleven", but he did use the phrase "terrorists around the world are planning to come here and kill us" nine hundred and eleven times during a 15 minute speech... a coincidence that did not escape the media's discerning eye. Can a presidential campaign be fueled almost exclusively on fear? If so, can other things be fueled by fear? Forget about biodiesel! Put that vegetable oil back into the deep fryer! I'm running my Honda Civic on the Washington Times and Bride of Chucky! b) subjecting ourselves to more and more crappy horror movies every winter. I mean, did you see the previews for Dead Silence? The ghost of an evil ventriloquist?! How much money did they waste on that? It's worth it to walk or ride a bike just so we don't have to deal with an eternity of that crap. (Awesome) Solution to Crappy Movies: With the aid of a time machine, we send a lone warrior back in time (preferably an attractive woman in a tight 70's style futuristic leather suit). She will have only her cunning and good looks to protect her. Her weapon of choice: a Powerbook loaded with iMovie. Her mission is simple: Preemptively take the worst horror movies of the year and combine them with the worst romantic comedies of the year. This way, instead of wasting people's time with an evil ventriloquest (Dead Silence) and a trite romance between two aging hipsters (Music and Lyrics), audiences would be treated to a crowd-pleasing movie where Hugh Grant and Drew Barrymore get attacked by an of army bloodthirsty puppets while Stevie Wonder's "I Just Called To Say I Love You" plays in the background. I would gladly waste $10 to see that. The Future Is Already Here Note: I suspect that our time-traveling savior may have already sprung into action. Last year, Miramax began production of a mediocre romantic comedy starring Luke "Warm" Wilson and Kate Beckinsdale. Meanwhile, Quentin Tarantino had begun filming the sequel to the ultra-gory hit, Hostel. Mysteriously, both projects were inexplicably cancelled and all records have since vanished. And now, coming to a theater near you, is the movie Vacancy, featuring Wilson and Beckinsdale getting sidetracked while on vacation and being forced to stay in a deadly roadside motel. Bless you, bodacious video-editing babe from the future! Humanity owes you one! Didn't we all learn the lesson that fear can't drive a society and that the answer lies in laughter, a la Monster Inc? just think--if this system worked, we could combine "You've Got Mail" with "Children of the Corn V", both from 1998. It could be called, "You've Got Creepy Albino Kids On the Rampage V" and it would be fantastic.